A ready-to-use Hamas attack tunnel that crossed over into Israeli territory opposite Jabalya in the northern Gaza Strip was demolished by the IDF over the weekend, chief army spokesman Brig.-Gen. Ronen Manelis said Sunday morning. 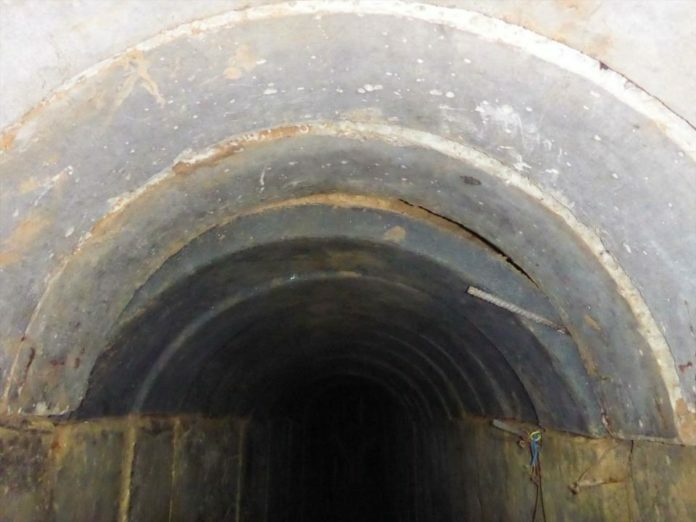 Manelis said the tunnel was demolished a few kilometers inside the Gaza Strip, with an opening on the Israeli side just over the border fence, and that it was connected to a network of tunnels inside the Strip. Manelis added that several kilometers of tunnels had been destroyed, calling the operation a “major operational success” that had caused “significant damage” to the Hamas tunnel project. Manelis did not specify how the tunnel had been destroyed. He noted that the tunnel was the first to be found in the northern Gaza Strip since the 2014 Gaza War. All the other five tunnels that have been located and demolished in recent months have been in the southern sector of the Gaza border area. Manelis said the IDF was closing in on its goal of demolishing and blocking the entire Hamas offensive tunnel operation by the end of 2018, noting that Israel has completed so far nine kilometers out of a planned 66 kilometers long above and underground barrier along the Gaza border. Manelis said Israel had been aware of the tunnel’s existence for some time and the decision to expose and demolish it now had been taken due to operational considerations. He added that the tunnel was located close to one of the locations where Palestinian protesters have held a series of violent demonstrations over the past two weeks. The IDF spokesman noted that Hamas was attempting to turn the border area into a combat zone, adding that the death of four Islamic Jihad operatives over the weekend as they prepared explosives was further evidence of the Palestinian organizations’ desire to carry out terrorist attacks. Defense Minister Avigdor Liberman tweeted that the tunnel was the longest and deepest that the IDF had unveiled so far. “Millions of dollars were invested in the tunnel, money that could have been spent alleviating the suffering of Gaza’s residents. Residents of Gaza, Hamas is wasting your money on tunnels to nowhere. We will find all of them,” Liberman wrote.